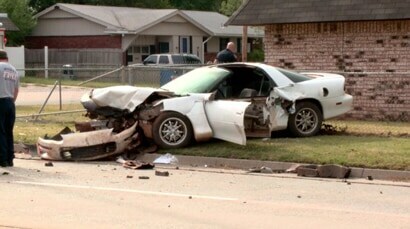 What started out as a police officer tailing a stolen car in Moore, Oklahoma, Wednesday morning, quickly turned into a high-speed chase before ending in a destructive crash. Sgt. Jeremy Lewis with the Moore Police Department said at first the officer was pursuing the suspect at only around 15 or 20 miles per hour, but things took a sudden turn. As the suspect approached an intersection, he all of the sudden just gunned it and T-boned a vehicle occupied by a mother and daughter, before smashing through a fence and barely missing a telephone pole. Altogether the pursuit only lasted about half a mile, but in the end, the Jaws of Life had to be used to get the suspect out of the car, before he as well as the mother and daughter he hit were transported to the hospital. The suspect, who was later identified as Bobby Killingsworth, does not appear to have a criminal history.